Dr. Tim Jackson wanted a tool to simplify a first-year engineering course for incoming students. He needed a solution to effectively teach a large number of students, especially those who have not previously studied the subject matter in-depth. Jackson selected Möbius Courseware to help his students bridge the gap between high school and university course material, helping them develop a better understanding of core concepts. Möbius Courseware also allowed Jackson to connect the theoretical and laboratory components of the course by providing customized background materials and pre-lab quizzes for students to review and complete on their own time. Jackson found that nearly 100% of students were completing the preparatory work, leading to a strong level of competence during lab work compared to previous years. Möbius Courseware has also allowed Jackson to better allocate his time, interacting more with students face-to-face. Jackson hopes to expand the use of Möbius Courseware in his courses and at the University of Birmingham as a whole. With growing class sizes, it can be a challenge for instructors teaching complex courses to effectively engage their students. It is essential to find tools that provide an optimal balance between efficiency, interactivity and functionality. For Dr. Tim Jackson, a senior lecturer in the University of Birmingham’s School of Engineering, the solution was Möbius Courseware, DigitalEd’s online courseware environment. In order to prepare students for class, Jackson and his colleague Dr. Mahvish Nazir developed background materials and pre-lab quizzes in Möbius Courseware. The students use the material to study and review on their own time to gain a better understanding of what they will be doing in the labs. Pre-lab quizzes, also developed in Möbius Courseware, help to ensure the students have a good grasp of the concepts before they go for their lab classes. These pre-lab materials are optional, but since implementing them, Jackson said he has noticed greater student engagement. “The optional pre-lab work is being completed almost 100%,” he said. “We’re seeing a good level of competence in students with the lab equipment compared to previous years.” Students also complete a summative post-lab quiz using Möbius Courseware that goes towards their grade. 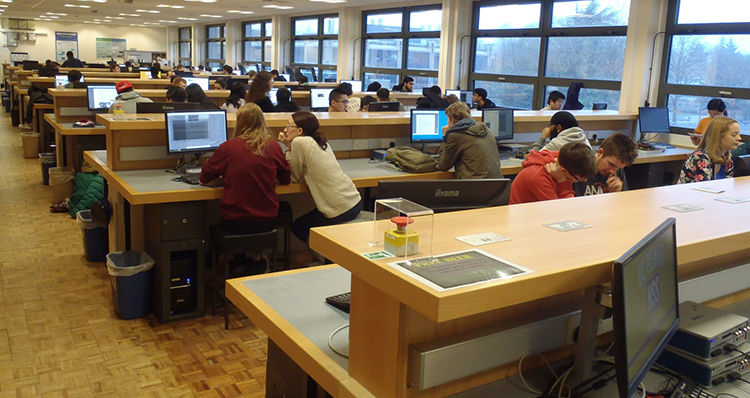 Dr. Tim Jackson uses Möbius Courseware to deliver an engineering course to his students at the University of Birmingham. Jackson refers to this kind of learning as interactive independent learning. The ability for self-evaluation and self-improvement is a point he emphasises often. He believes technology gives students additional flexibility for studying, and with that comes the responsibility and eagerness to master the material. When concepts are laid out in a variety of interesting ways, it stays top of mind for students. Möbius Courseware also allows students to attempt quizzes multiple times, revisiting materials to identify areas of weakness and strengthen their knowledge base. “A lot of universities are now trying to develop strategies for building independent learners; with Möbius Courseware, we’ve found a way to work that into the course framework,” he said. Möbius Courseware also allows Jackson to better allocate and maximize his own time. With growing class sizes, Möbius Courseware helps Jackson manage a large number of students. No longer encumbered with countless hours of marking assignments and tests, he can interact with students more and provide them with one-on-one support as required. With such a positive initial response, Jackson soon wants to begin using Möbius Courseware to cover more of the syllabus, helping more students bridge the gap between theory and practical application. Using Möbius Courseware, he will be able to educate students on how to use a variety of electronic and electrical equipment by constructing virtual lab experiments. He also plans to use Möbius Courseware to integrate physics laws into his courses, using math apps to create more in-depth simulations and allow students to solve complex problems.